Ever stood at an intersection and prodded at, leaned on, elbowed and otherwise palm-slapped the ever-living hell out of a crosswalk button and wondered to yourself if the thing actually does anything at all, really? Well – chances are, it doesn't. In a piece that will make you question every publicly accessible switch, toggle and button you encounter from this day forth, the folks at You Are Not So Smart reveal the truth about so-called "placebo buttons," the triggers we've been conditioned since birth to associate with instantaneous gratification that actually do nothing. 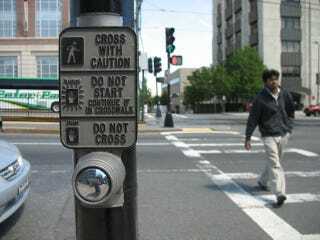 Crosswalk buttons. Thermostats. The close-door buttons in elevators. Why do placebo buttons exist? Because they are remarkably effective psychologically. And they are everywhere. "Placebo buttons are a lot like superstitions, or ancient rituals," the article reads. "You do something in the hopes of an outcome – if you get the outcome, you keep the superstition." SOME years ago, executives at a Houston airport faced a troubling customer-relations issue. Passengers were lodging an inordinate number of complaints about the long waits at baggage claim. In response, the executives increased the number of baggage handlers working that shift. The plan worked: the average wait fell to eight minutes, well within industry benchmarks. But the complaints persisted. Puzzled, the airport executives undertook a more careful, on-site analysis. They found that it took passengers a minute to walk from their arrival gates to baggage claim and seven more minutes to get their bags. Roughly 88 percent of their time, in other words, was spent standing around waiting for their bags. What it boils down to, Stone says, is a difference between occupied time and unoccupied time. Ten minutes of the former is experienced as shorter than ten minutes of the latter. More on the psychology of placebo buttons and waiting at You Are Not So Smart and The New York Times.